Horse races on this site began in 1852, and the Fair Grounds racetrack opened in 1872. 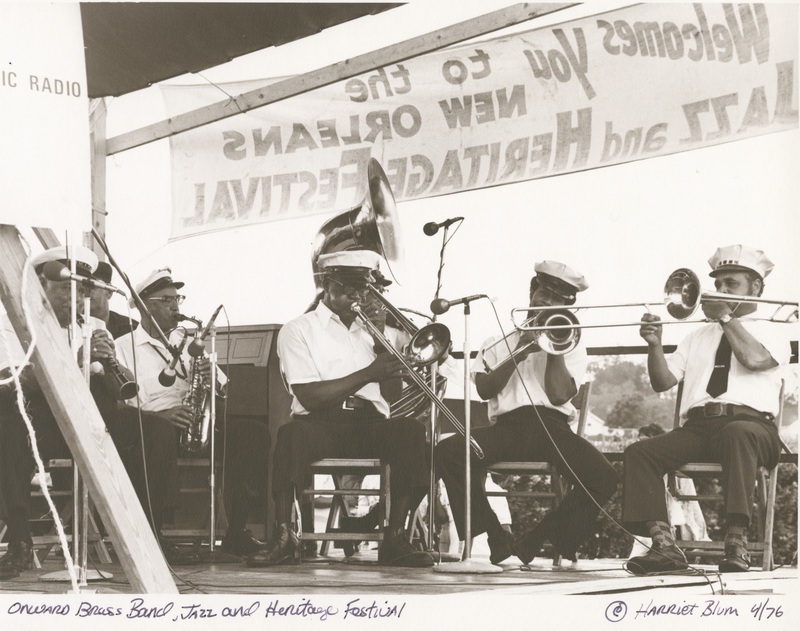 A century later it began hosting the New Orleans Jazz & Heritage Festival, which grew into one of the best-loved music festivals in the world. For devoted fans, the track transforms every April into a wonderland. Couples have been married in the crowd, and ashes of loved ones scattered on the infield. 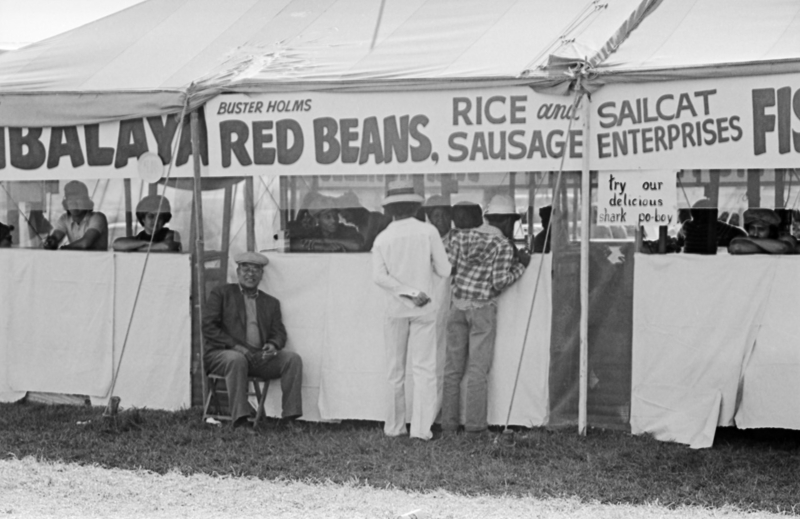 Advance tickets to the first Jazz Fest held here were $2.50 (the festival’s first two years were at Congo Square). 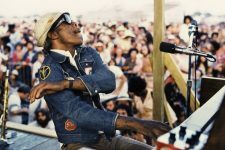 The stages measured 14 by 14 feet and had no barricades; the crowd leaned on the stage while Professor Longhair played. 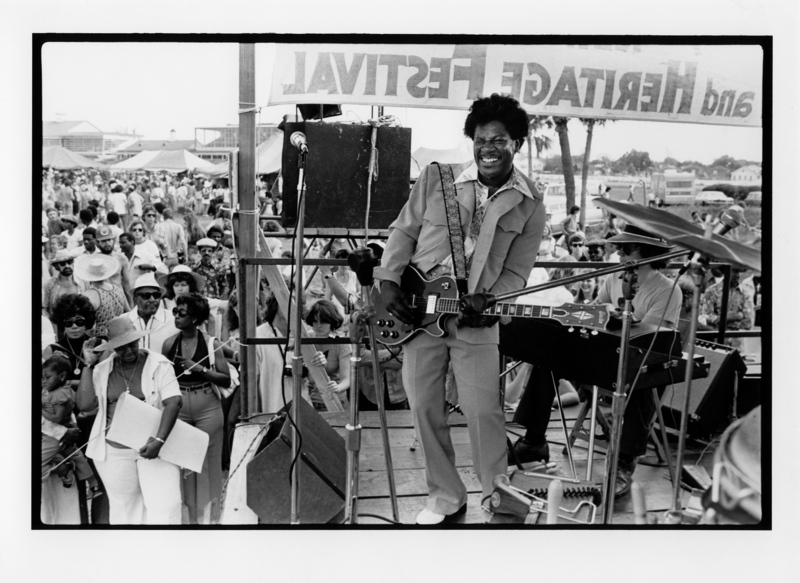 By the end of the 1970s the festival had mushroomed into a two-weekend extravaganza attracting hundreds of thousands. 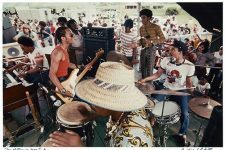 At the urging of activists, the 1979 edition included a showcase for African and African-American art controlled by and financially benefiting its practitioners—the part of the grounds now called Congo Square. The grandstand was devastated by a fire in 1993 (the same thing had happened in 1918). The new structure, ready for the 1995 festival, included more space for interviews and exhibits on Louisiana culture, including video installations by Sylvester Francis of the Backstreet Cultural Museum. It also offered festival goers the gift of air conditioning. 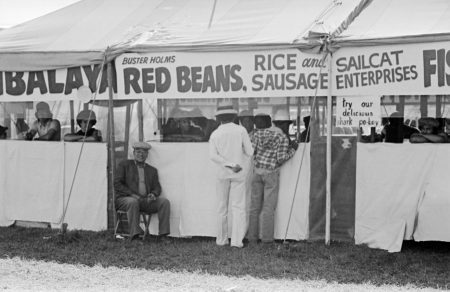 The festival continued to grow throughout the 90s, with stages, crafts, and food booths eventually filling a swath of parking lots outside of the track. 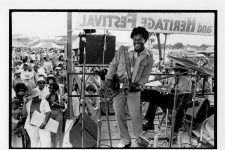 In 2004, Jazz Fest producer Festival Productions began a partnership with the entertainment company AEG Live, paving the way for more big-ticket headliners. 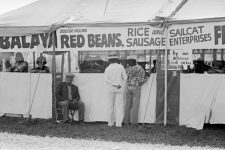 In 2006, with New Orleans still reeling from Hurricane Katrina and the levee failures, Jazz Fest managed to return to the Fair Grounds. By then many had come to see the event as synonymous with the city itself and its homecoming as a sign of recovery. Certainly, the festival’s economic impact and its role as a showcase for local talent have proved vital. 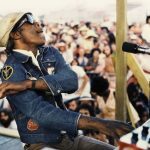 In the years since, the New Orleans Jazz & Heritage Foundation, the nonprofit that owns the festival, has expanded its year-round programming. Local musicians’ ties to the Fair Grounds predate Jazz Fest. Al Rose and Edmond Souchon reported that Buddy Bolden, the legendary “first man of jazz,” played here around the turn of the 20th century. 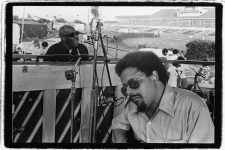 Star trumpeter Al Hirt’s first gig was playing the call to post at the track when he was a Jesuit High School student in the 1930s. While Hirt bugled, members of Fats Domino’s family were working on the grounds. Antoine Domino himself worked briefly in the stables when he was young—he came back a few decades later to headline Jazz Fest. Donald Harrison, Sr., the Mardi Gras Indian Big Chief, waited tables here and negotiated labor contracts with management as a shop steward (in 1998 he was laid to rest in St. Louis Cemetery No. 3, just beyond the festival gates). A brief history of the racetrack. From 1993, a TV commercial for the Fair Grounds featuring Pete Fountain, who performed annually at Jazz Fest. 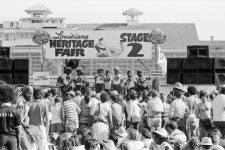 The official Louisiana Music Hall Of Fame Induction video for Ernie K-Doe, including footage of a Jazz Fest performance. Video posted by Egg Yolk Jubilee. The Meters at Jazz Fest. ©The Historic New Orleans Collection, 2007.0103.2.229. Photograph by Michael P. Smith. Professor Longhair (1918-1980) at the piano and Snooks Eaglin on guitar (1936-2009) at the 1972 New Orleans Jazz and Heritage Festival. 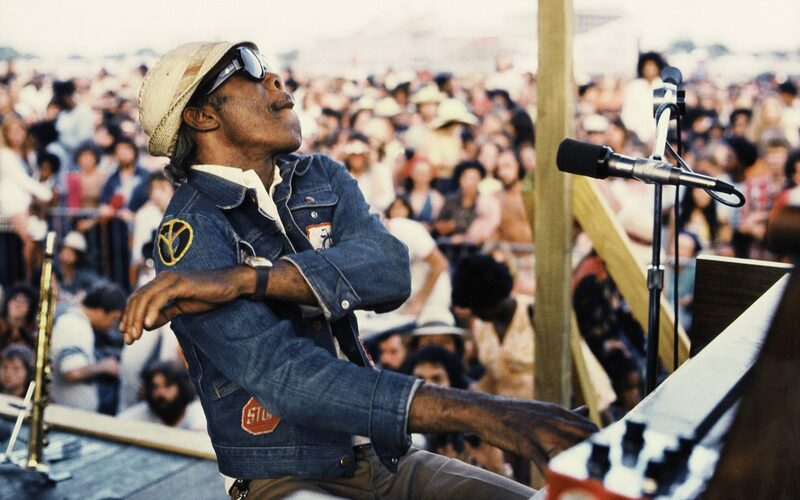 Professor Longhair (1918-1980) on stage. © The Historic New Orleans Collection, 2007.0103.4.673. Photo by Michael P. Smith. Earl King (1934-2003) performing at the New Orleans Jazz and Heritage Festival on Saturday April 26, 1975 at 2 p.m. on Stage 1. © The Historic New Orleans Collection, 2007.0103.4.662. Photo by Michael P. Smith. 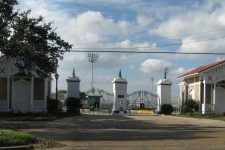 Entrance to the Fairgrounds in 2007. 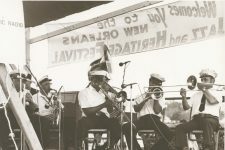 The Onward Brass Band performs at Jazz Fest in 1976. Courtesy of the Hogan Jazz Archive, Special Collections, Howard-Tilton Memorial Library at Tulane University. Photo by Harriet Blum. 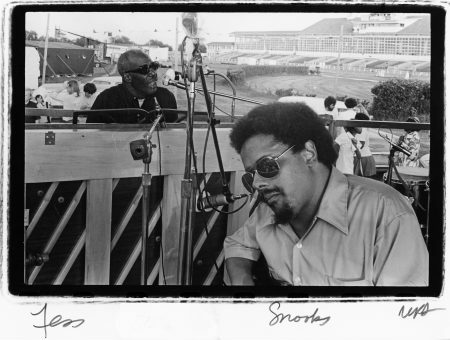 Jazz Fest in 1977, with the grandstand in the background. Courtesy of Jules Cahn Collection at the Historic New Orleans Collection. Photo by Jules Cahn. Further reading from the Journal of American Folklore.